Q: What is the difference between the Shichida 63-Day Math Program and the Math Dot printables? 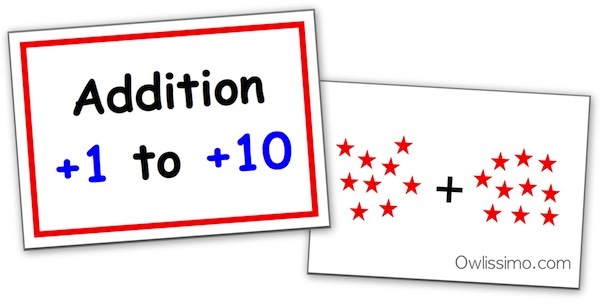 A: The Math Random Dots printable consists of dots and numerals 0 to 100, which can be flashed in different ways as suggested in the lesson plan ideas. The Shichida 63-Day Math Program is a way to flash specific quantities or equations on each day. In the pre-packed set, each day’s cards are placed in a separate cardholder. It covers quantity, addition, subtraction, multiplication, division, multitudinous equations (longer equations with brackets), moving systematically from dots to numerals. After completing one cycle (with minimal number of days rest in between), rest for 1 month, do dot worksheet / practice in daily life. It is suggested to complete 3-4 cycles in a year. This supposedly helps the child in mental calculation using dot imaging / intuition. The list of equations and instructions are copyrighted, so the easiest and most reliable way for non-Shichida students to access it is through the original flash cards package. I used to go through the cycles using the list of equations and red dot cards. Downsides: need to prepare the cards every night, for next day’s lesson. Ended up missing days. Also, it’s common for children to get bored of red dot cards within the cycle or at subsequent cycles. With the pre-packed cards, it’s very easy to be on schedule. Vee, Jae and Baby El love the variety picture dots. Also, if I miss a day, it’s easy to go through 2 days’ set if the child likes it. Q: If the Shichida 63-Day Math Program already covers quantity as well as 4 operations (addition, etc..), does it mean we don’t have to flash the printable dots? It’d be overlapping? A: In Shichida class, the sinsei flashes Random Dots, Variety / Picture Dots, Organised / Pattern Dots, and some Addition for toddler class. At home, parents are supposed to go through the 63-Day Math Program, Addition +1 to +10 and Multiplication. The 63-Day Math Program covers quantity from 1-50. The main objective is to help the child achieve lightning speed calculation through intuition. 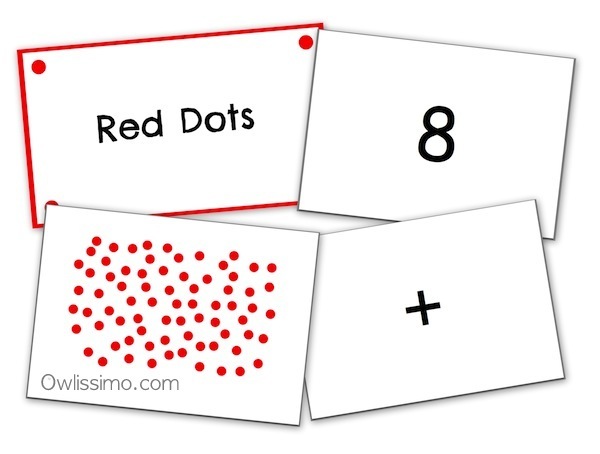 The Printable Random Dot and Pattern Dot Flash Cards cover 0-100. The objective is to help child see various ways of arranging a quantity of dots. It’s important to flash until 100, which is an important number. Once the child understands 100 (both arranged or random), she can easily move to 101-200, then 1000’s. If you try the lesson plan ideas, they cover beyond 4 operations. For instance, odd/even number, squares, etc. 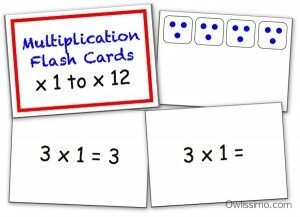 The Addition Flash Cards help in recitation and visualisation of the addition facts. 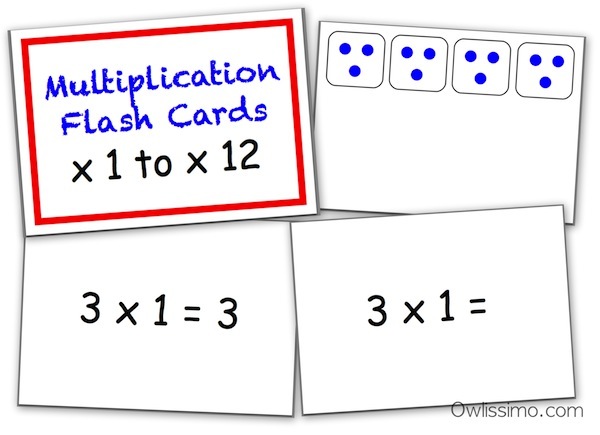 Similarly, the Multiplication Flash Cards help in recitation and visualisation of the times table. The 63-Day Math Program and Printable Math Flash Cards complement each other, that’s why I cover all at home. I believe this complete system helped Vee in his mental calculation through intuition or working out in his head, depending on his choice at that moment. The strong foundation in understanding numerical relationship allows him to grasp new math concepts easily. Jae, at 2 years 8 months, recognises small quantity of objects by sight, is trying to count until 100 (both from rote and one-to-one correspondence), and does simple addition. Q: I’ve seen another 63-Day Math Program set at a lower price. Can I use that? I bought 1 set of the original Shichida 63-Day Math Program and 1 of “the other set” (completely different box packaging) to compare. 1. 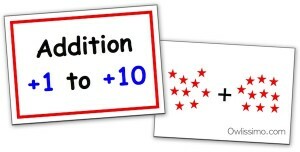 The other set: Some consecutive cards consists of random dots in the same pattern, the only difference is adding 1 more dot. This is a very simple way of creating the flash cards, saving time and cost. However, for the child looking at the cards, he’d see largely the same pattern, and note the +1 relationship. He may not capture the entire quantity. Ideally, every card should have a slightly different random pattern. Both the original Shichida 63-Day Math Program and my Random Dot cards offer this. 2. The quality of cards differ: The original Shichida 63-Day set has thick and smooth cards. The other set has cards which are less smooth. 3. The instruction manuals are almost identical, except that “the other set” has paraphrased about every sentence. As a role model to my children, this is a practice I cannot support. After considering the above 3 points, I decided to help other mums get the original Shichida 63-Day Math Program instead of “the other set”. Have fun with right brain math! My cousin in UK is interested in Shichida 63 day math program. I am living in Canada but I am going to visit her in a month. I am wondering if I am able to order to buy this program in Canada. I am living in Toronto. Hi Joyce, yes… we’ve found a cost-efficient way to ship internationally, including Canada and UK. Hi Puky, 65-day is the old program; 63-day is the updated version. Repetition is using the same set of cards, so there’s no need to re-arrange if baby is happy with the sequence. I live in Seoul, Korea. Could you also ship to Seoul, too? and because I’m a working mom, I really need the whole thing to be explained to me, telling me what to do everyday… I read a book about Shichida education and I really want to provide it to my daughter but it’s difficult for me to figure out what and how to do it. Could you give me some help on this? Hi CM, have sent you an email. Yes, I agree that it’s a bit challenging to know how to do home practice via reading alone. For equation like 1 +1=2, I need to say ” one plus one equal to two” then when I only need to flash the answer card (2 dots) when I say “two”? Hi, may I know why didn’t the website prompt us to input our mailing address after we clicked the “join” button when we want to purchase the 63 day dot program cards? Hi Mrs Tan, after payment, you’d receive an auto-email requesting for your mailing details. Currently, I’m using a membership site software, to allow you to access the printables instantly upon purchase. Hope this clarifies. Please let me know if you need further assistance. Have a great day! My children (3years and 4.5years old) just started right brain training recently and just started random dot card (0-50) to them. Is it appropriate to introduce the 63 days dot programme now to them now? Or should wait for them to get familiar with the random and pattern dot (0-100) before start the program? Also, how long waiting/ shipping time to get the 63 dot packagr after placing order. Tks. Hi Yean, since you’re starting random dot and pattern dot, you may start 63-day program concurrently or quite soon. The first few days covers random dots (1 to 50). If you’ve just flashed 0-50 and are starting on the 63-day program, then go straight to Addition. Skip the random dots for this cycle, to prevent boredom. After 1 cycle, rest for 1 month, then start with Day 1 again. Within a day, I may flash these: 63-day, other topics, random dots, other topics, pattern dots, other topics, variety dots. I usually keep random / pattern / variety dots to the same number pattern. 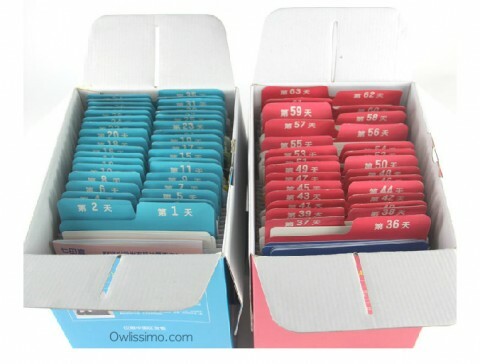 There’s ready stock in Singapore, first-paid-first-delivered. Usually reaches you within a few days to a week, via courier. Tks for your reply. Is the 63 days already included the random(1-100)and pattern dots(1-100)? Then we dont have to print the printable copy? Is there any differences between them? Is the 63 days imported from japan and included english manual? Tks alot for your guidance. Hi Jenevy, thank you for your interest. 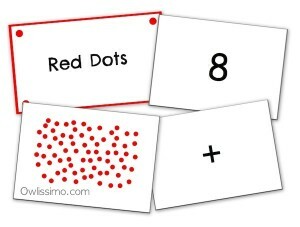 The free printables for the math program includes random red dots and pattern / organised dots. The hard copy cards contain a big variety of picture / variety dots to help sustain the child’s interest. I’d say these would be rather sufficient. For more info, please click here. I would like to purchase the math program for my almost 2 year old boy. But I would love to know your opinion on teaching math with the Japanese abacus- soroban. Do you think it will be confusing to learn both way? Hi Carmen, for almost 2-year old, I would still use 1 bead / picture to quantity of 1 representation. Abacus-soroban uses 1 top bead to represent 5. Many children cannot get this at a young age, too abstract.